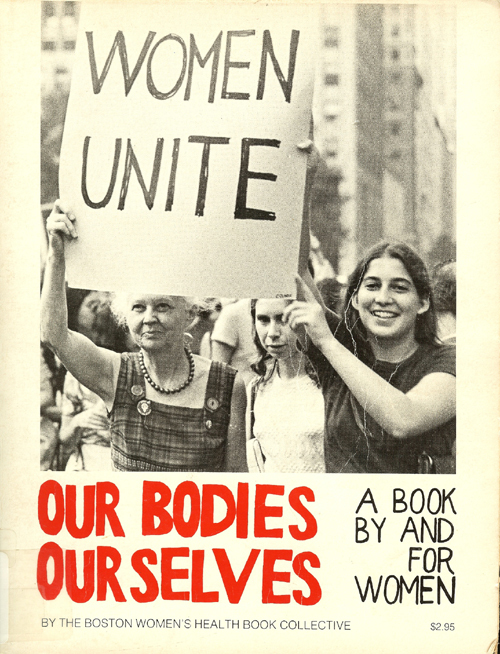 In the early 1970’s the book Our Bodies, Ourselves by the Boston Women’s Health Collective appeared in our house. Or, more specifically, in my older sister’s bedroom. I think it was a gift from my mother, perhaps given to my sister with the chapter about birth control in mind. But that wasn’t the chapter that drew me in. Flipping through it one day when my sister was out of the house, I came across “In Amerika, They Call Us Dykes.” I vaguely remember a disclaimer about the authors of this section having separate control of the chapter’s content, an explanation of the letter “k” in Amerika, and perhaps an apology for the lack of women of color (some things sadly stay constant), but what stands out in my memory is the existence of the chapter at all. The word dyke and even lesbian were new to me. I read and re-read the text and stared at the photos dozens of times over the next few years. I told myself I was reading out of curiosity, not unlike my perusal of the book of Diane Arbus photos in my brother’s bedroom. But that book I paged through a few times with my siblings. Our Bodies, Ourselves I slipped into my own bedroom. I read it with the door locked. The corduroy-clad, vest-wearing dykes thrilled me with their defiance of the mainstream: their lack of dependence on men, their radical co-ops and open relationships. Their redefining of love. These were not the butch/femme couples of the fifties (at least, that’s not how I remember the black-and-white photos), nor the high-heeled, lipstick lesbians of the 80s and 90s, or the commitment-ceremony, civilly-unionized, legally-married couples of the 2000s and 10s. These were dykes. One photo offered three friends goofing around, one women’s hand cupping another woman’s breast. Another featured a rascally woman in a loose jacket and lopsided hat. Dykes. Dykes. Dykes. Except, at age 13, I wasn’t able to say this anyone yet, not even myself. Much of this had to do with the undiagnosed Crohn’s disease that was inhabiting my body and playing havoc with my hormones — muting them, in fact. Ten years hence, a diagnosis and surgery would correct that and the attraction I felt towards women would quickly evolve beyond my tempered imaginings. By my mid-twenties, I was out to myself and my friends, and a few years later, out to pretty much anyone in the world who wanted to know. I was, by 29, a writer expounding on lesbian-feminist topics, adding my own voice to the lesbian liberation struggle.